You have to ration out the Lisa Samson books these days. I trickled this one out through 2011 and the begining of 2012, since it was the last one on my shelf unread. 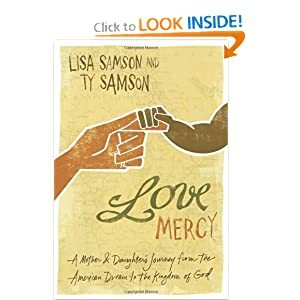 The book is divided into parallel narratives (Lisa and her daughter, Ty) describing a trip to Swaziland, but we don't get to Africa until around page 90. The journey begins years before in the Samson family move from suburban Baltimore, MD to urban Lexington, KY, and the larger move, from an insulated, self-referential worldview to a global worldview. It's an intense read, but worth it. My only complaint is that Ty's sections were difficult to read for an old fart like me, being a script-like font on a grey background. The low contrast and challenging font reduced readability considerably. Check it out. Who knows when the next Samson novel will surface? Start off the day listening to Garrison Keillor's Writer's Almanac. It's five minutes long, there's a new one every day, and ten years of archives. In keeping with my streak of reading books by people with a middle initial of R, I grabbed this not-so-little volume as research for a character in my current work-in-progress, Muffin Man. I found the first half of the book to be helpful for my purpose, which was to get a better handle on how to write the character. The second half, which is devoted to getting treatment and maintaining a balanced life, was less relevant to my story, so I just skimmed through it. I would expect that if you're dealing with this disorder, either for yourself or someone close to you, this book would be helpful. I haven't read any others, but I expect it is unique in its approach of combining researched clinical information with personal experience. My one complaint is that it isn't available for Kindle. I'd much rather have a 426-page reference book on an ereader than in print. I urge the author (hi, Lana, howzit?) to pursue releasing this and her other books, especially the out-of-print style guide, as ebooks. A. Please be quiet! That's the smartest thing you could do. -Job 13:5 NLT. Those who know me realize how important this verse is. A fellow author recommended this book to me for research into my bi-polar character in Muffin Man. Ten days later I had finished reading the book, and that included shipping time from Amazon. It was that fascinating. As the subtitle states, this is a memoir. Jamison not only suffers from what she calls manic depressive illness, as opposed to bi-poloar disorder, but is a professof of Psychiatry at the John Hopkins School of Medicine. So she is both a patient and a doctor, an expert by virtue of both extensive study and personal experience. This is not a clinical book about the disease, it's a book about one woman's experience with the disease, albeit a very educated woman. As such, it was an invaluable resource for me and of immeasurable help in tweaking my character. As I set out to write the novel and it became apparent that a significant supporting character would be bi-polar, I wrote intuitively based on my past conversations and direct experience with Dangerous Dan, my first-hand source when it comes to such things. It occured to me in December that perhaps I should broaden my understanding of the disease beyond one set of (very amusing) anecdotal data points, and thus the reading. There is much to commend this book. It's and entertaining, engaging, informative, and unexpectedly moving account. Check it out. I picked this book up after I released What Would Jesus Drink, hoping it would give me some insight into how we could go from a 1789 Baptist minister owning a distillery and possibly having a hand in inventing bourbon to the 2006 Southern Baptist Convention making a resolution that no one be allowed a position in the organization if they drink. As it turned out, the book was helpful in that it documents the rise and fall of the temperance movement that highjacked several Protestant denominations and turned them into anti-scriptural prohibitionists. It also discusses Prohibition and the years following. There's a lot of interesting information in this book. There were a few parts I found less interesting, such as extended discussions of the business aspects of the wine, beer and liquor industries and markets, down to discussing specific companies for extended periods of time. There are several places where Peck apparently states some suppositions or conclusions of his own without qualifying them as such. Also, he makes space for the occasional fit of editorializing and moralizing, ending the book with some serious call-to-action language. I agree with many of his views, but I was looking more for historical and sociological information than opinions. Still, a worthy read for those interested in the topic. This fascinating book was written by the creator of Brewvana.net and early appreciator of the 1996 essay that eventually became What Would Jesus Drink? He even quotes it in the book. J. is a homebrewer living in Iowa. As the book indicates, he became fascinated with the tale of the monks of Neudeck ob der Au outside of Munich who are credited with developing the rich-and-malty doppelbock style of beer to nourish their bodies through lengthy Lenten fasts.Packed with carbohydrates, calories and vitamins, this unfiltered "liquid bread" is said to have sustained the monks from Ash Wednesday to Easter, and more than 300 years later, the monastic history and quality of this beer style is well-known throughout the world. For the 2011 Lent season, J. did a 46-day beer-and-water fast to test the legend of doppelbock’s origins, church connections, and nutritional value, as well as his own will power, and blogged about it on Brewvana. And he did it while continuing to work his job at the newspaper. The first part of the book describes the history of the beer, of fasting, and what led him to the project, which I found interesting. He also goes into the medical aspects of the fast in great detail, including all that could go wrong, healthwise, from living on beer and water alone for over six weeks, which I found less interesting. But the meat of the book is the daily journal of his experiences during the 46 days, and this part is excellent. His little project attracted international media attention, including folks like CNN and Fox News. J. gets on his soapbox a few times, but mostly it's just a window into the home life of a regular guy with an odd mission.